With MHL you can unchain your media from your phone or tablet and easily display videos, games, photos and more on a big screen. It can be liberating and it's all achievable with the help of just a single cable, yet a lot of people are probably unaware of its existence and many who do know of it still don't really use it. That's a shame, because MHL carries a whole lot of potential, from obvious uses like watching stored videos on a big screen to more inventive applications such as using it in combination with a keyboard and mouse to type documents, essentially turning your smartphone into a desktop computer in the process. To find out more about MHL, its potential uses and its future we spoke to the MHL Consortium, a company founded by Nokia, Samsung, Silicon Image, Sony, and Toshiba, which is responsible for licensing and promoting MHL technology. The first thing to get out the way is what MHL is and how it works. Essentially one end of an MHL cable will plug into the micro USB port on your phone or tablet while the other will plug into an HDMI port on a television or monitor and your phone's screen will then be mirrored on the external screen. Dr Judy Chen, President of the MHL Consortium, explained that it's a "connectivity solution optimised for outputting a mobile device to a larger display. "Like HDMI it's uncompressed, which is important as that allows it to handle everything in real time, setting it apart from wireless solutions." A MHL Consortium spokesperson added that it can "simultaneously charge the device and it offers the unique ability to control your phone features via the standard TV remote. "MHL-enabled products include smartphones, tablets, Digital TV's, TV accessories, Blu-ray players, audio / video (AV) receivers, monitors, projectors, adapters, automotive accessories, cables, and more." Probably the most obvious use for an MHL cable is to play videos on your phone but view them on a larger screen. That could mean playing locally stored videos or taking advantage of an app such as Netflix, essentially turning your handset into a home media player. Since MHL is simply mirroring the screen of your phone it's compatible with any and all apps. But there are loads of other uses for MHL too. You can use it in combination with a controller for gaming on a big screen and almost replicate a console experience in the process. The MHL Consortium believes that "MHL is a viable substitute for a games console or a set-top box. 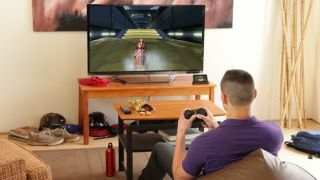 "When it comes to gaming, an MHL smartphone can be seamlessly paired with a wireless game controller and games can be played with zero lag on the larger screen display." You can use it to view photographs or even connect your smartphone to a Bluetooth keyboard and mouse and turn your phone into a full desktop computer. It comes into its own for all these things even more when travelling, as while you might have a computer, a games console and a media player at home, simply packing an MHL cable and a few optional accessories such as a controller will allow you to bring home entertainment to your hotel room. And that's just the tip of the iceberg. You could also use it while working out, to view exercise apps and videos on a big screen while keeping your phone charged. Or if you have an infotainment system in your car you could interact with your phone through it with the help of MHL and even mirror a satellite navigation app to it.